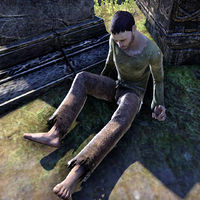 Beggar Matthew is a Breton beggar who can be found in Daggerfall. He is afraid he is going to be killed by a murderer who's killing off beggars in the alleys of Daggerfall. "Nobody cares about us poor beggars." "Could you help me? I'm next. I know I'm going to be next." "Thank you. It's a terrible thing to be poor. You're invisible. No one cares." "I'll tell you whatever I know"
Tell me more about the killings. "The watch found Old Gianne last night. The night before, it was Ragged Ron. When one of us dies, they blame the cold or the plague, but Gianne and Ron were cut up something horrible. Now they say it's a wolf." "Can you believe it? A wolf in the city? But that's what the watch thinks. Who am I to say any different? Still, it feels more like murder than the work of a wild animal to me." Why would someone kill beggars? "We're everywhere. We're easy prey. Some folks just don't like us. Take your pick. The killer isn't stopping. It's brutal. Sooner or later, it's going to start killing a better class of citizen. Then the watch will take action." "Friend, the poor of Daggerfall owe you our lives. We don't have anything, but if we did, we'd give it all to you." This page was last modified on 7 February 2017, at 04:32.